There are new additions every day to Bahrain’s culinary scene. And whether you live in Bahrain or you are just visiting, you should try out the country’s eclectic cuisines. With so many nationalities living and working in the Kingdom, you will always find what pleases your taste buds and offer you the perfect fusion of flavors. From Japanese to oriental eats and Levant dishes, we gathered 11 restaurants in Bahrain that offer toothsome eats. Craving some authentic Japanese delights, then Chawan Authentic Japanese Tea House is definitely your go-to. 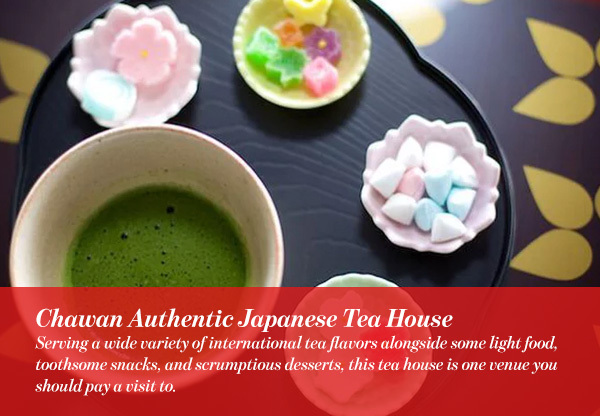 Serving a wide variety of international tea flavors alongside some light food, toothsome snacks, and scrumptious desserts, this tea house is one venue you should pay a visit to. 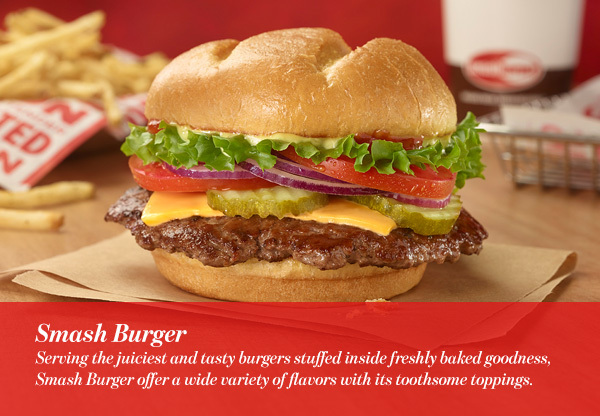 Serving the juiciest and tasty burgers stuffed inside freshly baked goodness, Smash Burger offer a wide variety of flavors with its toothsome toppings. And if your sweet tooth is acting up, Smash Burger desserts menu will do the trick. Just make sure when you go there to ask for the house’s Ice Cream Sandwich. 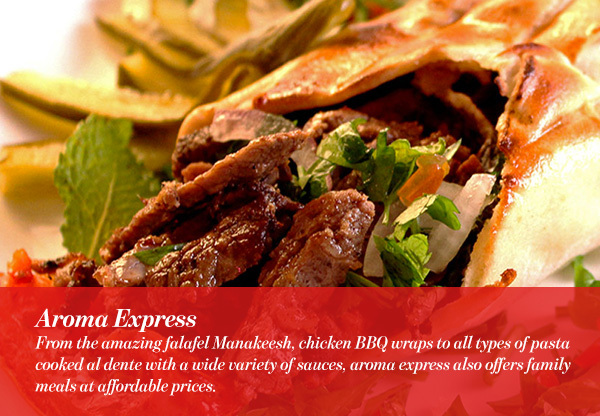 Located in Juffair, Aroma Express serves all sorts of Arabian food with a twist. From the amazing falafel Manakeesh, chicken BBQ wraps to all types of pasta cooked al dente with a wide variety of sauces, aroma express also offers family meals at affordable prices. All the way from Mexico comes Casa Mexicana with it’s authentic Mexican eats. 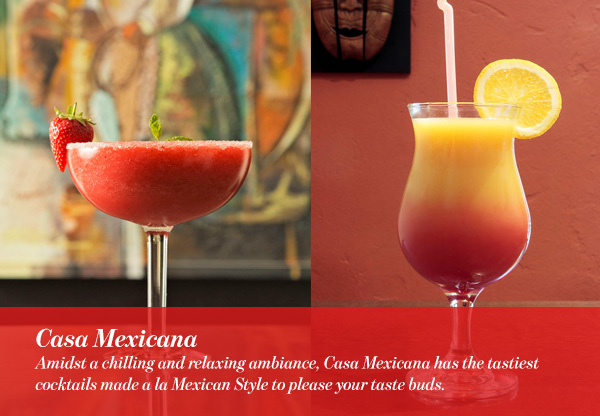 Amidst a chilling and relaxing ambiance, Casa Mexicana has the tastiest cocktails made a la Mexican Style to please your taste buds. It is definitely one of the best restaurants in Bahrain. 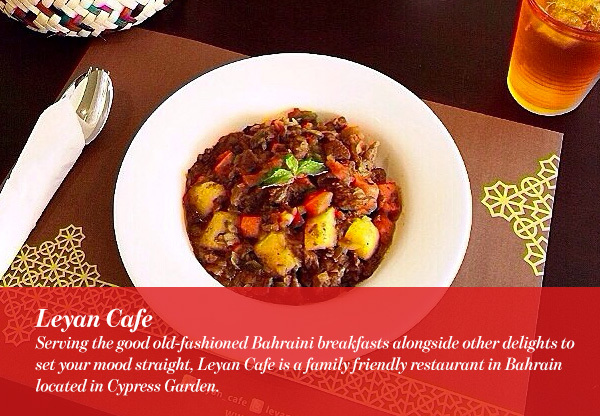 Serving the good old-fashioned Bahraini breakfasts alongside other delights to set your mood straight, Leyan Cafe is a family friendly restaurant in Bahrain located in Cypress Garden. It is the perfect spot if you are looking to lay back, relax and enjoy heavenly tasted bites. A Lebanese restaurant with two branches in Bahrain, one in Saar and the other in Juffair, Fakhrudin offers authentic Lebanese treats. 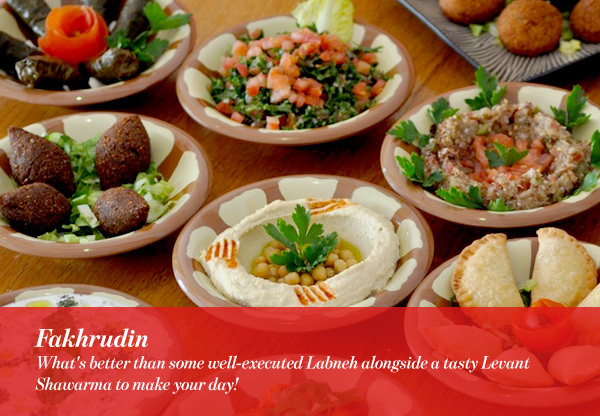 What’s better than some well-executed Labneh alongside a tasty Levant Shawarma to make your day! At Nomad you are set to have a day well spent. 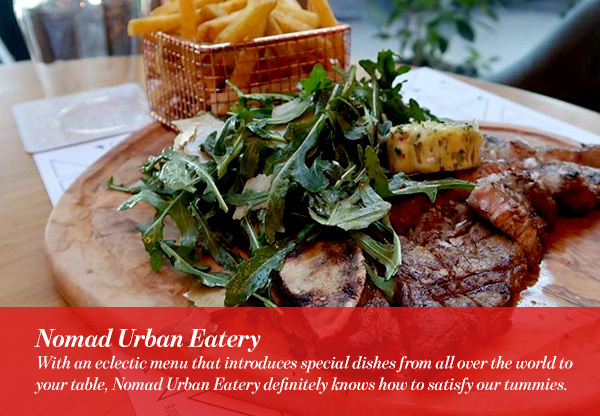 With an eclectic menu that introduces special dishes from all over the world to your table, Nomad Urban Eatery definitely knows how to satisfy our tummies. An amazing ambiance and equally prompt services, this is one of the restaurants in Bahrain you should try out during your visit to the Kingdom. 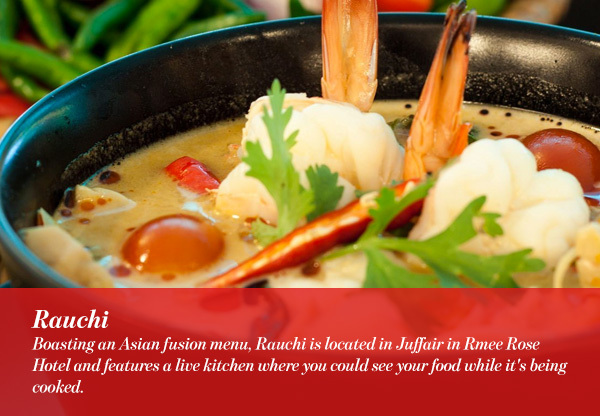 Boasting an Asian fusion menu, Rauchi is located in Juffair in Rmee Rose Hotel and features a live kitchen where you could see your food while it’s being cooked. Rauch is the perfect place if you are looking to have a private dinner amidst relaxing ambiance and toothsome eats. You can now eat an authentic Egyptian Koushari at Koushari Basha. 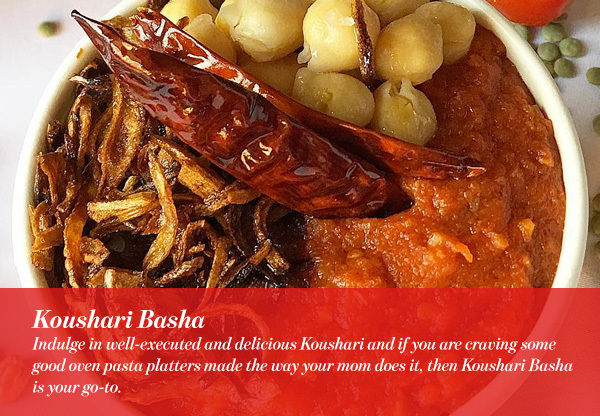 Indulge in well-executed and delicious Koushari and if you are craving some good oven pasta platters made the way your mom does it, then Koushari Basha is your go-to. If your sweet tooth is acting up then Monkey Cookies will satisfy your cravings. Originally from Kuwait, Monkey cookies have come to Bahrain to spread joy through it’s masterfully crafted baked goodies. With a wide selection of crispy cookies, you can find Monkey Cookies in Ramli Mall.